Pane tipo di Altamura from "Local Breads"
Franko's recent blog about his project to bake Pane tipo di Altamura (Pane di Altamura...my ongoing project) reminded me that this bread had gotten lost on my “to bake list.” I have baked a number of breads with semolina and a couple with durum (finely milled durum flour) my favorite of which has been Tom Cat's Semolina Filone from Maggie Glezer's "Artisan Breads". However, I've never before baked an 100% durum bread. My reading about the Pane di Altamura and Franko's blog inspired me to attempt this bread, finally. I have three books with formula's for Pane tipo di Altamura: Carol Field's “The Italian Baker,” Franko Galli's “The Il Fornaio Baking Book” and Daniel Leader's “Local Breads.” The first two use a yeasted biga and additional commercial yeast. They also use a mix of bread flour and semolina. 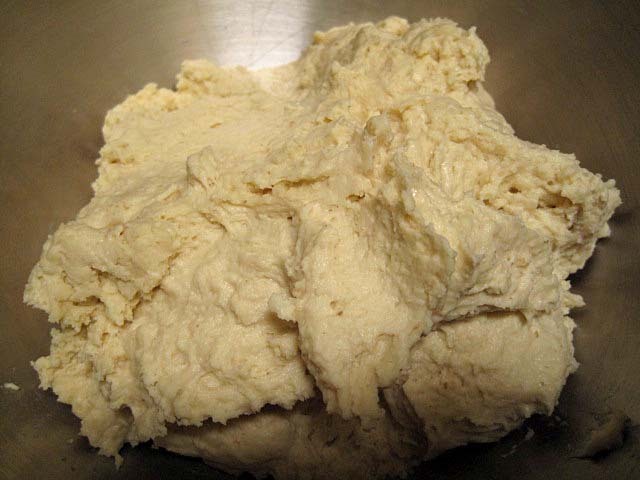 Leader's formula uses a biga started with yoghurt and semolina flour. Leader's formula also differs from the other two in specifying a higher dough hydration. Based on my bias in favor of wild yeast and my past positive experiences with breads from Leader's book, I based my formula on his. I deviated from Leader's formula and method in a number of ways which I will describe. I converted my stock starter to a durum biga and did not use yoghurt. The major compromise was that I only fed my starter once with durum flour. I had planned on three refreshments before the final mix, but the weather forecast is for temperatures over 105ºF for the rest of the weekend. Since it is only expected to get to a chilly 98ºF today, it seemed prudent to bump up the baking schedule and try to avoid using the oven when it's 105 or 107ºF. So, what's described is what I actually did, with notes indicating significant deviations from Leader. Disperse the starter in the water. Add the flour and mix thoroughly. Ferment at room temperature for 12-14 hours. 1. Ideally, one would add one or two additional builds to convert the biga to 100% durum. 2. Leader's formula for the final dough calls for 200 g of semolina biga, but his formula for the biga produces only 177 g. If you follow Leader's formula, you need to build more biga than this. Leader's formula calls for 200 g of biga. I was only able to use 170 g. Given the very warm kitchen temperature today, using less starter is probably reasonable. Accounting for the flour and water in the biga, the final dough hydration is actually 71%. Mix the final refreshment of the biga 8-12 hours before the final dough mix and ferment it at room temperature. In the bowl of a stand mixer, disperse the biga in the water. Add the flour and mix with the paddle for 1 minute. 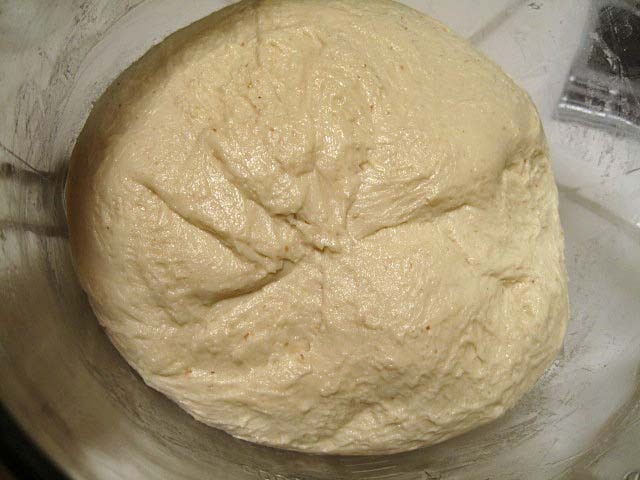 Transfer the dough to a lightly oiled 2 qt container. 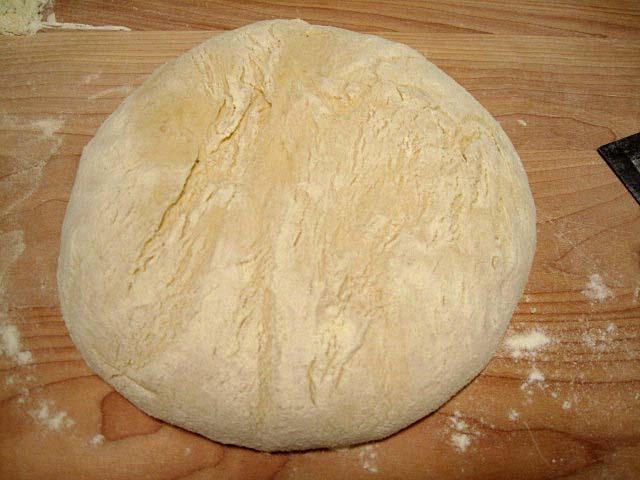 Transfer the dough to a lightly floured board. Shape into a boule. About an hour before baking, preheat the oven to 500ºF with a baking stone and steaming apparatus in place. 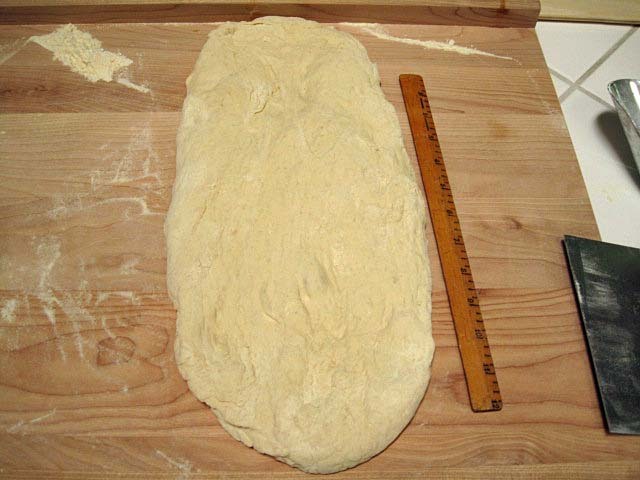 Transfer the loaf to a lightly floured board. 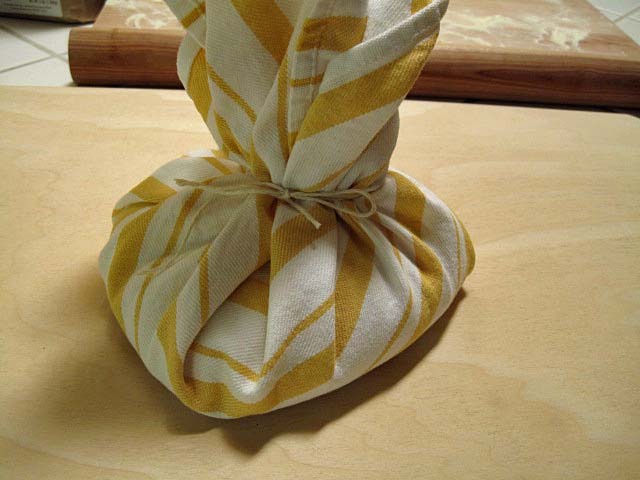 Transfer the loaf to a peel dusted with semolina flour and dust the surface of the loaf with flour. Turn the oven temperature down to 400ºF. Transfer the loaf to the baking stone . Steam the oven lightly. Transfer the loaf to a cooling rack and cool for at least 1 hour before slicing. 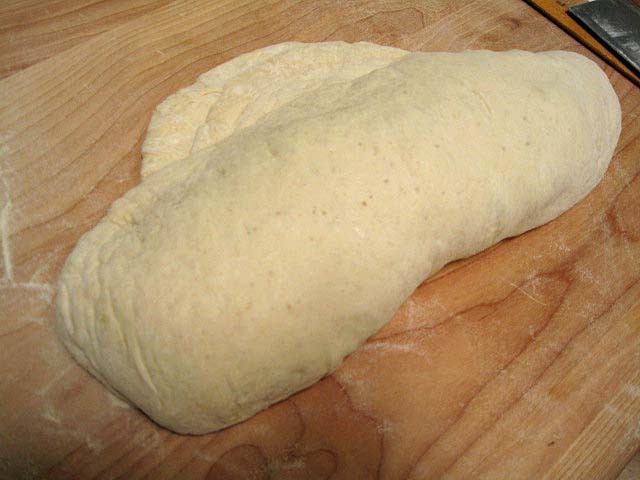 Dough stretched out. First step in final shaping. 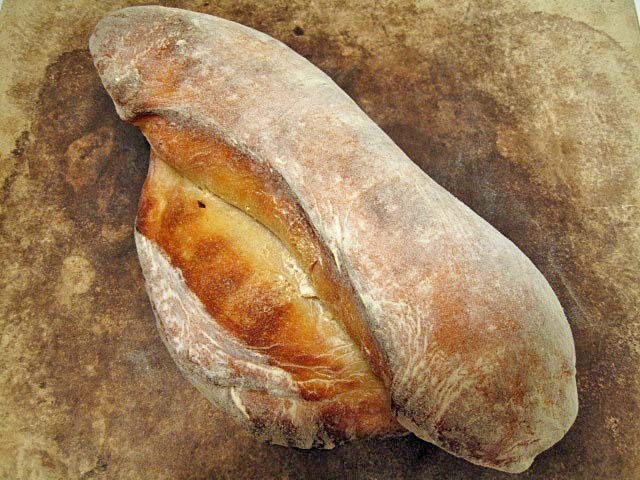 The aroma and flavor of the bread are most remarkable for a prominent sourdough tang. The flavor otherwise is very nice, but I cannot identify distinctive flavors I would associate with durum, as opposed to other wheat flours. The crust is chewy over the fat part of the loaf but quite crisp over the flatter part. This is a loaf I'm pretty sure will have a nice crumb to it judging by the volume. As well, the crust is much better than anything I've managed so far. The key point I'm taking from your notes regarding fermentation are the high ambient temps, something we haven't had here on V.Island for any length of time this Spring/Summer and has no doubt been a factor in my own mixes. Your dough looks 'stiffer' than any of the ones I've made, giving me a much better understanding of what to aim for. From your photos it looks like there are some flecks of bran in the mix. Are these from the durum flour or the starter...if that's what I'm actually seeing? Looking forward to the crumb shots David, confident they'll show a much more open crumb than my efforts to date. Nice baking! 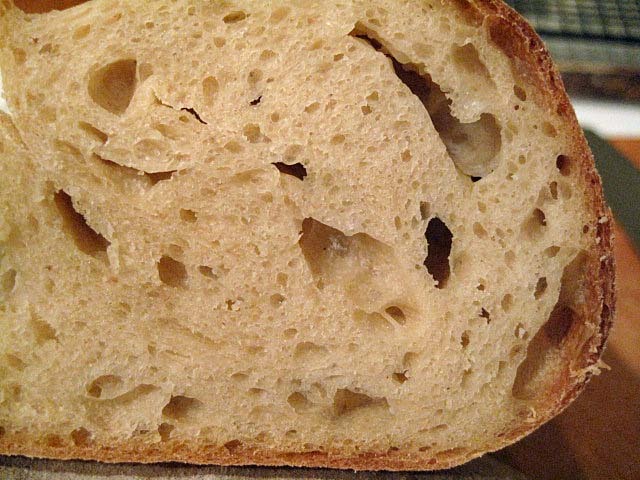 The crumb shots are now added. There were not any bran flecks I could see. I used durum flour from KAF, and it was very finely milled, light yellow in color. There is some whole rye and ww in my stock starter, so maybe that's what you are seeing. Leader does call for a relatively large inoculation of starter, as I'm sure you noticed. The crumb color in my photos is accurate. It was not as yellow as I'd expected. I wonder if the mixing oxidized too much of the carotenoids. I might try a slower speed machine mix or hand mixing when I make this again. I'd like to make a loaf with the "priest's hat" shape. I also wonder if the flavor profile would be different had I gone through three levain builds as originally intended. I appreciate your kind words, and thanks for the inspiration! I'm looking forward to seeing your next bake. 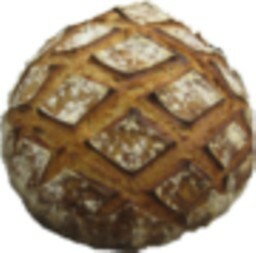 Beautiful bread, david! Durum flour, another one of those elusive ingredients i'am looking forward to meet. 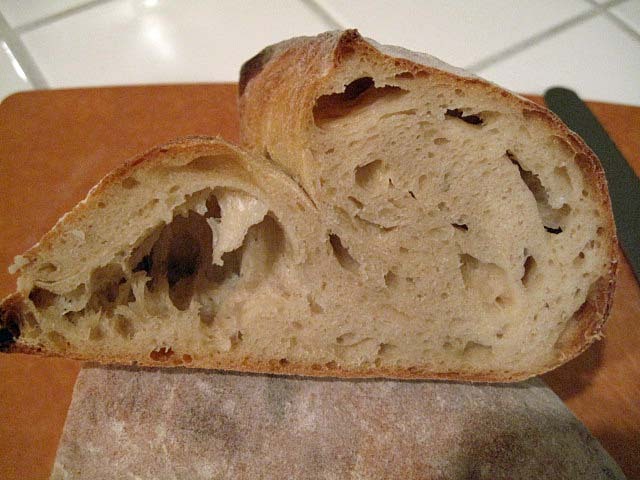 Ananda's comment on my trip to Genzano put Pane di Atamura back on my bake list for next week. Your description and results will be helpful! As inspirational as Leader's book is, the editing oversights (like the biga amount needed) can be a bit frustrating and having them highlighted is helpful! If I were to do one thing differently, it would be to make at least 2 and ideally 3 builds of the semolina biga. As ever, David, thank you for such a thorough investigation. The notes you make will help many people, I'm sure. Whilst Leader's book is inspirational in so many ways, I am sure it is the one I have heard more people finding large errors in than any other. So what of the salt at 2.6%? Did you find that too much in the final taste of the dough? Maybe that is why you struggled to "identify distinctive flavours"? I'm sure your one area identified for improvement is quite the best; a refreshment regime of more building would undoubtedly have produced a stronger durum leaven. One thought I had: the crust of this loaf is outstanding, and the crumb of the main block of the loaf is very open and inviting: clearly high quality dough! I just wondered if you had made up the "cap" shape, say, half way through final proof, rather than at then end, do you think you would have found that easier, and produced a better crumb through and through? It is extremely challenging to manipulate fully proved dough in a gentle enough way to produce the final shape at full proof without damaging the delicate dough structure. I just point you to the cavity evident under the "peak" section of the finished bread. Surely this has only come about right at the last minute as you were shaping and loading to the oven? 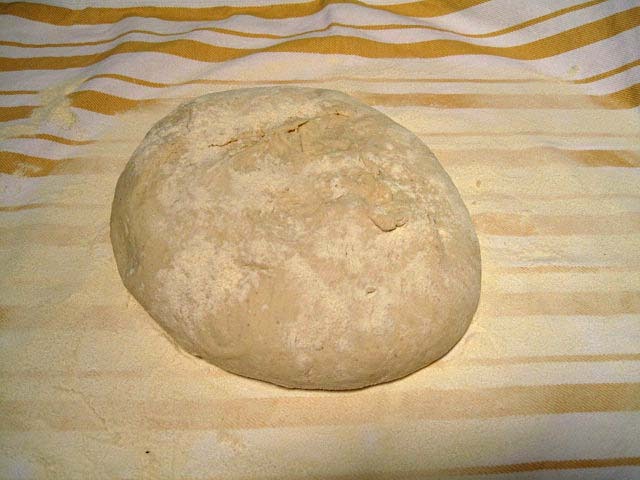 A small amount of collapse in the dough, and the gas within is forced to the weaker part of the loaf causing a big hole, rather than random, but smaller cell distribution. Just a thought; such a top loaf, however! Thanks for you comments, Andy! "Local Breads" is an editing tragedy. It's a shame, because it's such a wonderful collection of stories and breads. The bread did not taste at all salty, and I'm pretty sensitive to this, I think. I followed Leader's procedure for proofing and shaping, but the points you make regarding the timing of final shaping and the crumb structure are excellent. I very much appreciate your thoughtful suggestions, as always. Thanks for documenting how you made this bread (and taking the time to post all of the photos along the way!). It's so nice that you and Franko have posted about this one, as I just picked up Mr. Leader's book; it makes me happy that I have the formula and story, after seeing both of your lovely loaves. Looking forward to making this one someday - your notes and the comments/responses in this post and Franko's, will be quite helpful. Looking forward to seeing your bake of this bread. I think you will enjoy "Local Breads." Just be sure to check the formula calculations! David, thanks for the heads up. It's a wonderful video, Andy! 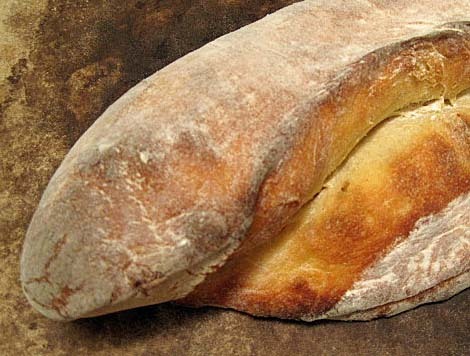 Very nice write-up, photos and bake of your altumura bread. I found this video, in English of an ancient bakery that makes the Altumura bread, showing it with an open crumb, crispy wfo crust. It's on You-Tube 'Bread from the Wood-Fired ovens of Altumura'..I was researching some duram flour Focaccia's..as I posted on 'Franko's ongoing quest' about..hope you enjoy! The video shows many shapes, but the priest's hat shaping is at about 4:20 min. into it.